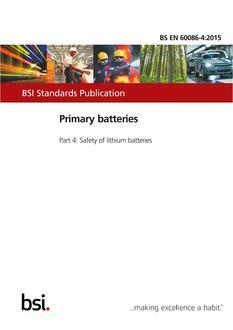 BS EN 60086-1:2016 is intended to standardize primary batteries with respect to dimensions, nomenclature, terminal configurations, markings, test methods, typical performance, safety and environmental aspects. As a primary battery classification tool, electrochemical systems are also standardized with respect to system letter, electrodes, electrolyte, nominal and maximum open circuit voltage. NOTE The requirements justifying the inclusion or the ongoing retention of batteries in the IEC 60086 series are given in Annex A. The object of this part of IEC 60086 is to benefit primary battery users, device designers and battery manufacturers by ensuring that batteries from different manufacturers are interchangeable according to standard form, fit and function. Furthermore, to ensure compliance with the above, this part specifies standard test methods for testing primary cells and batteries.